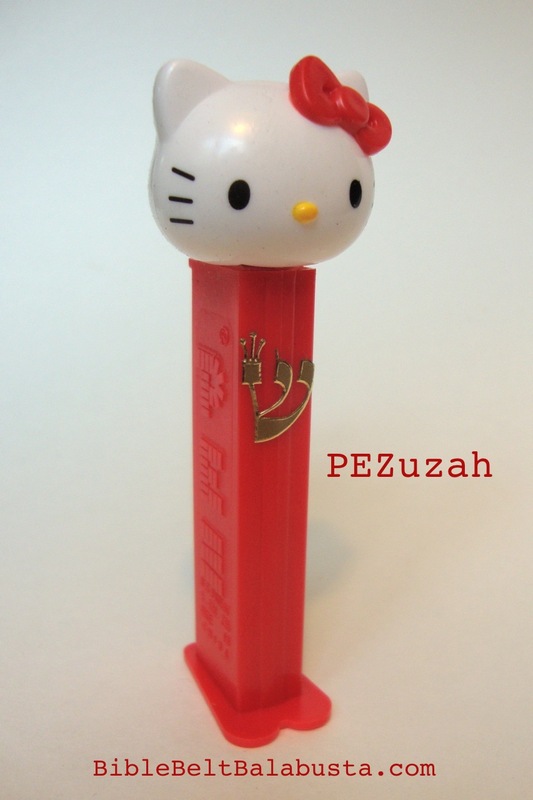 This will be my short Havdalah candle post. I shall simply tell the whys and whats. The hows, I’ll save for three additional posts: one for rolled beeswax sheets, one for dipped beeswax tapers, and one for a repurposed Hanukkah candle version. Four posts just might be enough room to wax lyrical about the ups and downs and sideways of a seemingly simple process. I feel compelled to record my experiences so that others may skip the labyrinthine bits and get right to the part where everything turns out well. Two Shabbat candles in separate holders = two Shabbat candles. 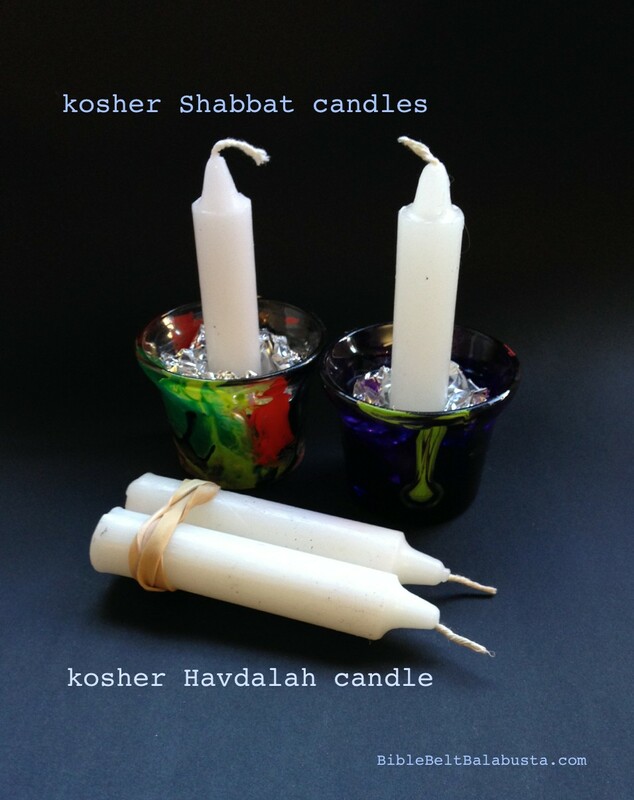 Two Shabbat candles held in one hand = one Havdalah candle. Then, I show two Hanukkah candles and even two birthday cake candles. Note I said minimum requirement. A candle can be kosher and not be pretty. 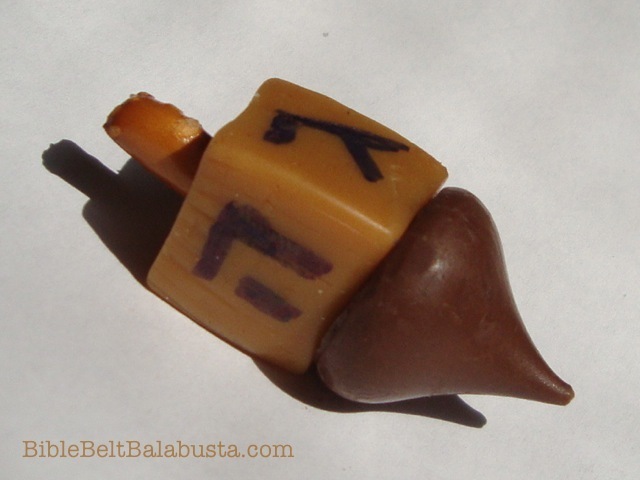 A candle can be kosher and yet be short-lived enough to barely make it to the end of the Havdalah blessings. My students and I try to make our own handmade candles as beautiful and functional as possible (and we bag another mitzvah by trying: Hiddur Mitzvah = to beautify a commandment). But to first learn the minimum is to put the whole lesson in perspective. I love how shocked kids (and grownups) are to find out that holding two fireplace matches in one hand creates kosher “eish” for Havdalah. 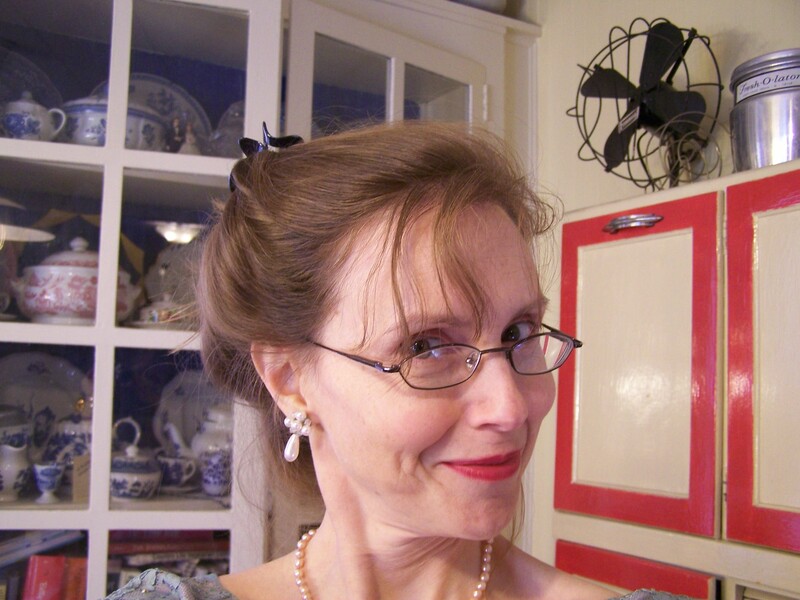 So, yes, the more the wicks the better, a la Hiddur Mitzvah. And, the prettier the better. UNLESS, the pretty, zillion-wicked candle is multiplied by 30, with each one in the unpredictable hand of an unpredictable child at a group service. Those flames can leap 12″, which freaks me the heck out. In this case, let me recommend a certain, ugly E-Z version as a safer alternative. 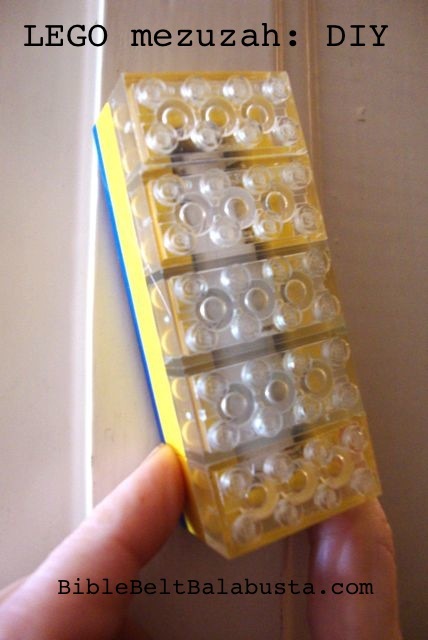 If you plan a Havdalah wherein many children will be wielding lit candles, please see my post about repurposing Hanukkah candles. • 1.) Beeswax sheet rolled around a wick. 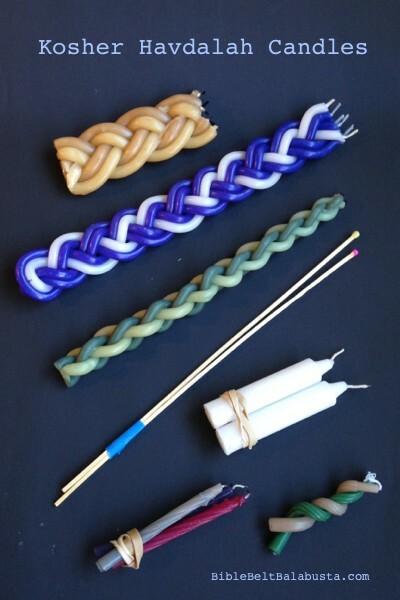 Roll 3 tapers and twist or braid into one big candle. Or, roll one big taper with more than one wick inside (add wicks one at a time, in different layers). • 2.) Beeswax dipped tapers. Dip 3 narrow tapers and twist or braid into one big candle. Dip again to fuse them. • 3.) Poured candle (a.k.a. pillar candle). Melt wax (soy, beeswax or paraffin) and pour into a mold that contains at least two wicks anchored at the bottom. 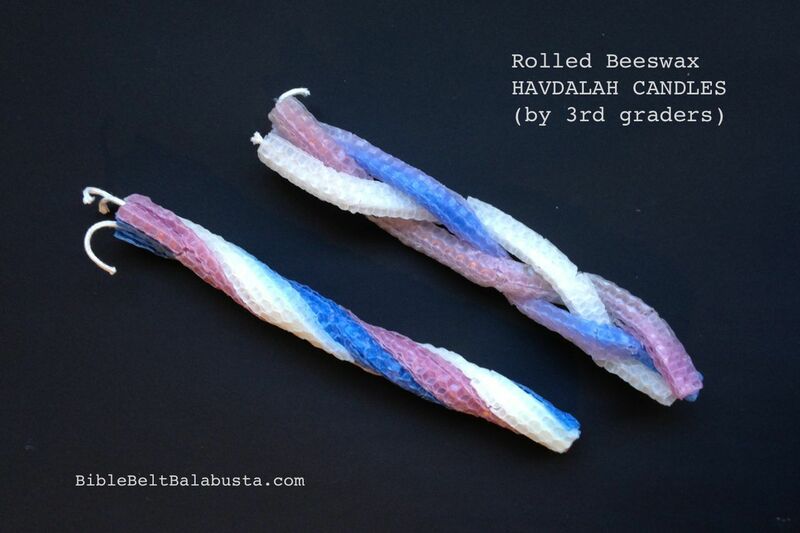 Show your students the fancy schmancy pillar Havdalah candles from Sfat (Safed) in Israel, home of Kabbalah / Jewish Mysticism and perhaps of the Havdalah ceremony itself. I hope you’ll share your own candle-making experiences, gripes, successes and questions below. I crave candle community. *Contrast the Shabbat candle blessing with the Havdalah candle blessing. For Shabbat, we are commanded “to kindle the light of Shabbat:” “lihadlik ner shel Shabbat.” Ner is singular for one lamp (or candle). For Havdalah, we praise God “Who creates the light of the fire.” “… borei m’orei ha’eish.” Eish is FIRE, not lamp. And fire, the Rabbis say, means flame that is torch-like and comprised of more than one wick. 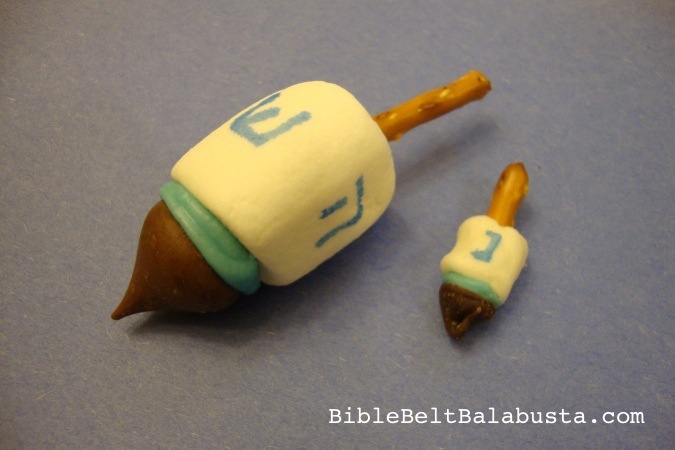 Havdalah article by Rabbi Susan Silverman at MyJewishLearning.com: Havdalah basics, blessings. Short Havdalah video, animated, from Moises House Rocks. I show this to supplement our 2nd and 3rd grade lessons. 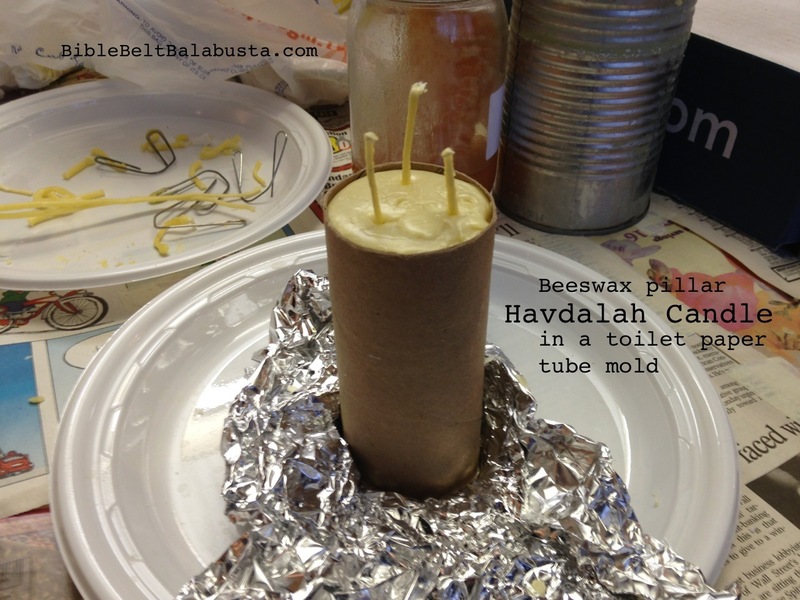 This entry was posted in Activity, Crafts, Havdalah, Shabbat and tagged beeswax, candles, Havdalah, hiddur mitzvah. Bookmark the permalink. Hi, we at JKidLA love your blog! 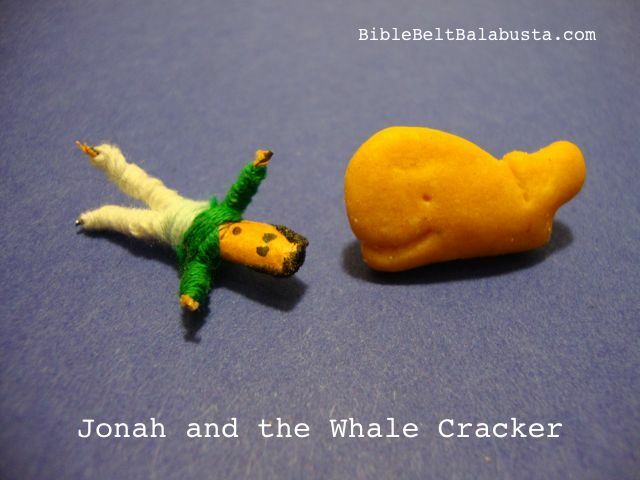 In the process of re-imagining our website, http://www.//jkidla.com and want to post image + link to this craft on our homepage. Would that be ok with you? Our 4th grade kitah bet is creating a havdallah set and learning about havdallah. I enjoy all of your creativity and look forward to more. Thank you. Jill, thanks for letting me know! I’d love to see pics of what they come up with.